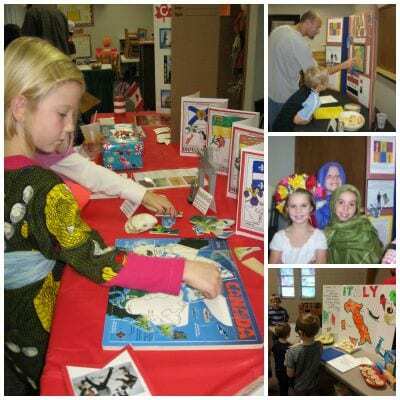 A Geography Fair provides a creative approach to learning geography. The concept is simple–each student researches a country, state, region, or another topical geography project. We have had some unique projects at our fairs including a home town, dinosaurs from around the world (where dinosaur bones were found), Ancient Egypt, and the rainforest. The goal is for the child to be able to choose something she finds fascinating. If you have an establish homeschool cooperative, you can pitch the idea of a homeschool geography fair. It's not hard to sell the idea as there are lots of benefits to hosting a fair. Your family will learn about another place and culture. Your student will interact with people of all ages–answering questions, sharing interesting information, and even learning from some of the people attending the fair. Family and friends will see that your student really does do something all day (other than drink smoothies in their pajamas) and that there are other crazy homeschooling families out there, too (who also really do something during the day!). People attending the Geography Fair will learn about many different countries. Your student will also learn about (and become interested in) many cultures & countries as he visits the displays of other homeschoolers. With your guidance, your student will learn the basics of research and planning as you work together to make this project a reality. Once you have your homeschool group excited about the fair, determine a date. Our co-op has our fair every fall in order to avoid bad winter weather and the busy spring season. Your group should decide how long the fair will last. We chose 2 hours, and it has worked well (for six years!). 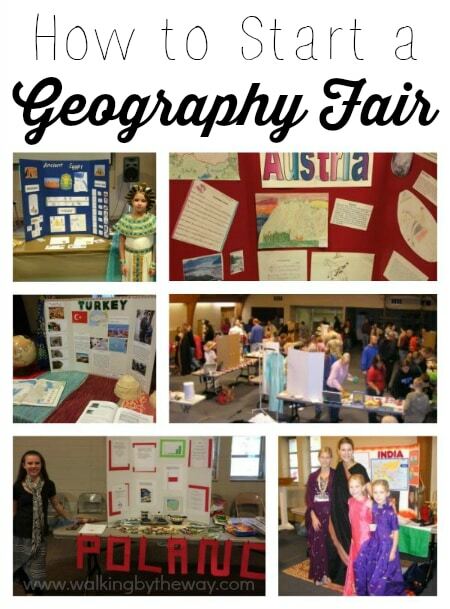 Your group should choose a geography fair coordinator to determine a date, place, and time for the fair. The coordinator can help with other things, too, such as making invitations, encouraging families to keep working on their projects, etc. 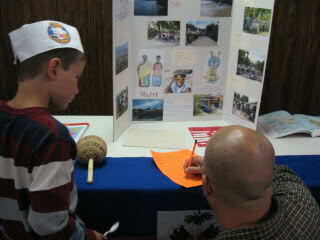 As families choose countries, they should submit their choices to the geography fair coordinator for approval. This helps insure that each person has his own topic for the fair. Once you have approval, start researching the country you’ve selected. Encourage the families to start working about 6-8 weeks ahead of time. Doing the project bit by bit will keep the child from burning out. Elijah did one project per week. The week before the fair, we spent a lot of time just working on the fair, but I am so glad we didn't wait until the last week to do everything. Remind the members in your group that this isn't a competition. Students should do their best with what they have. Some countries are easier than others. Some families have more people working on the project than others. Just have fun and enjoy the learning! It might be fun to have a Country Hunt (scavenger hunt based on the displays) during the fair. In order to create a Country Hunt, I had moms send me fun facts (about one week before the fair). I used three facts from each country. You don't need a ton of people in order to have a fair. We only had eight displays at our fair, and it was great. I would say the ideal number would be between 10-15 displays. Don't stop here. 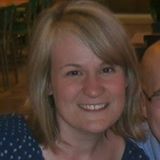 Find more information about preparing and gobs of geography fair project ideas on my Geography Fairs Page. You are so awsome!! I love the country hunt idea! I think I am going to convince my son’s school (a Montessori school) to do something like this. Thanks for always having the greatest ideas. Keep them coming. Thank you for sharing all this great information!! My co-op is wanting to start a Geography Fair and this information is just what I was looking for!! 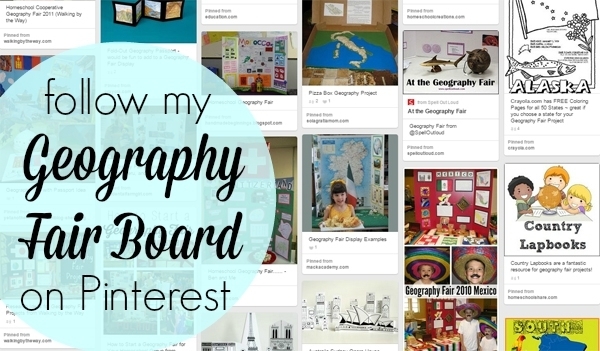 So I really want to do a geography fair with some local families. I was on Pinterest and it led me here:)))) Love the way The Lord works!